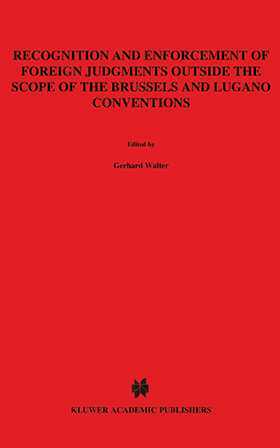 This important book, the third in the Civil Procedure in Europe series, provides a comparative overview, for 18 European countries, of those areas of recognition and enforcement practice that have not been harmonised by the Brussels and Lugano Conventions. Each country's practice in these areas is described and analysed by a national expert distinguished in the field of civil prodedural law. The contributions are written in either English, French, or German, and are followed by summaries in both remaining languages. Bibliographies are included to enable the reader to locate material for further study. special proceedings for recognising and enforcing judgements. A comparative contribution by the editors analyzes the similarities and differences between the various European systems. The countries covered are Austria, Belgium, The Czech Republic, England, Finland, France, Germany, Greece, Hungary, Italy, Luxembourg, The Netherlands, Norway, Poland, Portugal, Spain, Sweden, and Switzerland. The first book in the series is Seizure and Overindebtedness in the European Union. The second book is Recourse Against Judgements in the European Union.